How does one drag a people with a sense of enough into the capitalist enterprise? The answer to this question contains the history of capitalism: a process that has traditionally required the outright enslavement of groups of people, or at the least, the appropriation of their commons. Like any major trauma suffered jointly by a people, for most Haitians, the ripples through the ground on the afternoon of January 12, 2010 will forever bisect time into pre and post-Earthquake. 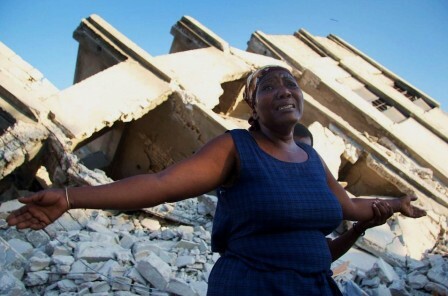 The magnitude-seven tremblor, which would have been deadly in any case because of its shallow depth of eight miles, had an epicenter coincident with Leogane, a town of 134,000, and 15 miles from Port-au-Prince: the country’s capital city of 1.9 million. 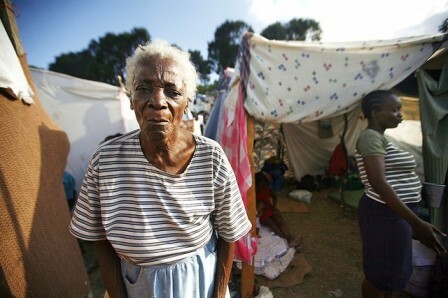 In a country of 10 million souls, more than one million were made homeless and over 300,000 killed. Everybody lost someone. The casualties would have been two thirds fewer if the policies of agencies such as USAID, the World Bank, and IDB, had not been deliberately designed to overpopulate this urban center. In a calculated set of policy decisions, foreign-aid agencies lavished money on Haiti’s big landowners to facilitate their switch from a cultivation of traditional food crops for domestic consumption to the cultivation of crops such as mangoes and corn for the U.S. market. Impoverished small farmers were then herded into Port-au-Prince to provide the baseball, t-shirt and blue-jean producing sweatshops of the city’s free-trade zones with an infinite supply of needy unemployed. 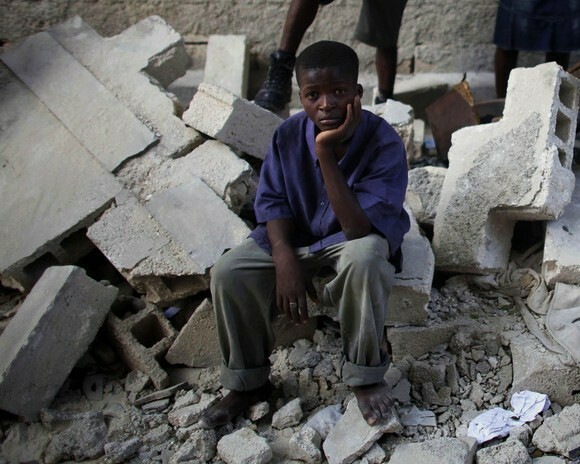 Instead of bringing relief to Haitians, the world’s generosity in response to the Earthquake merely brought the country to the attention of its most rapacious disaster predators. Almost immediately, and despite a ban on adoptions, numerous plane loads of children were transported to the U.S., France, and Holland. The removal of a group’s youngest citizens has traditionally been the way to undermine a culture; this continues at a rate of about 2,000 children per year from Haiti. In the political sphere, by Spring 2010, former U.S. President Clinton had managed a coup that forced an 18-month State of Emergency onto the country and brought it under the rule of a group of wealthy investors called the Commission for the Reconstruction of Haiti (CIRH). This group has been dismantled, but only because it became incorporated into the government after the fraudulent elections of 2010-2011. For example, CIRH member Laurent Lamothe became Haiti’s Prime Minister; other members Gregory Mevs (of Haiti’s wealthy family) and Bill Clinton are the co-chairs of the so-called Presidential Advisory Council for Economic Growth and Investment. Thus far, the crowning achievement of this group has been the inauguration, on October 22, 2012 of Haiti’s Caracol Industrial Park: a massive sweatshop zone that employ workers for a maximum of $0.87 per hour. The toxic dyes from the park and the influx of population into this previously rural area are expected to destroy a river and the neighboring coast. Despite the Haitian Constitution’s clear statements that “coasts, springs, rivers, water courses, mines, and quarries” are a commons, the CIRH veterans have set about to sell all of them. Many farmers who opposed the landgrabs have paid for it with their lives. The stage for an epidemic of disease was set in July 2010, when a group of 1,280 United Nations “peacekeepers” were sent for their Summer training to Kathmandu during a Nepalese cholera outbreak. The first confirmed case of cholera occurred within five days of the return of these soldiers into Haiti from Nepal. 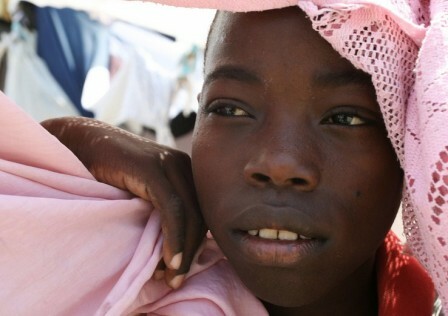 Over half a million Haitians have been infected with cholera, and more than 7,000 have died of their infections. As the population clamored for clean drinking water, medical NGOs such as Partners in Health (PIH) and UN agencies such as PAHO and WHO have promoted the adoption of oral cholera vaccines of questionable utility instead of attempting to control the epidemic through careful treatment and epidemiology. After a vaccination trial showed no difference between the control group and the inoculated group, the researchers concluded that the controls had somehow acquired immunity by their proximity to the inoculated group. The outcome has been a recent disbursement of $2.2 billion for a 10-15 year cholera eradication program. Simultaneously with the introduction of cholera, there has been a sabotage of the municipal water systems of Haiti’s largest cities. For example, Gonaives has had no municipal water since December 2011 due to the destruction of three out its five pumping stations. Saboteurs removed over 1,500 feet of electric cable along with a control panel and a switch for current distribution. 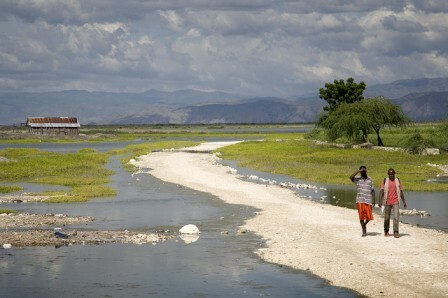 A similar dismantlement of Cap Haitien’s water supply happened in Summer 2012. Thus two cities that had suffered no earthquake damage at all were nevertheless devastated by predatory deconstruction. The provision of locally-grown foods to Haitians has become almost as difficult as the provision of water, as a rash of arson has hit the country’s open-air markets. Markets in Gonaives and in the Saline, Tabarre, and Petionville areas of Port-au-Prince, where many farmers store their goods, have burned in suspicious fires. Traders in the Port Market, in particular, reported having received numerous threats before the market went up in flames on June 18 and again on July 13, 2012. To make matters worse for small merchants, the government has instituted a series of bans on vending in city streets and imposed difficult conditions for transit. For example, buses and tap-taps are no longer allowed to transport passengers together with their goods or livestock. Haiti’s agricultural production had already dropped by 20 percent between 2010 and 2011, but the continued persecution of the small farmers, coupled with a liberalization of trade with the Dominican Republic, through which much of Haiti’s food is now transported, have essentially wiped out the country domestic production. Elsewhere in the country, well away from the earthquake’s damage, companies such as Brazil’s Construtora OAS Ltd have labored at their own dismantlement projects. For example, OAS unilaterally stopped work in mid-course on a 43-mile stretch of southern road that it had been contracted to build for IDB and CIDA (Canadian International Development Agency). Likewise, in the north, the construction of a six-mile stretch of road was stopped before the road was paved. During a visit in February 2012, Brazilian President Dilma Roussef pledged $40 million for a 30 MW hydroelectric dam in the Artibonite region: the site of Haiti’s rice paddies and one of the most fertile areas of the country. She also promised to grant 1,200 visas per year to Haitian families entering Brazil. Many of these citizens are being trafficked to Brazil to serve as scabs for large utility companies like GDF-Suez, which have come under violent protests from Brazilian workers. 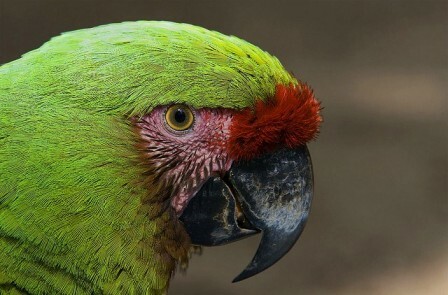 By far the most horrific news about Haiti has been the discovery of gold in the Massif du Nord mountain chain: an area that encompasses one third of the country, is replete with archaeological sites, and provides a refuge to many endangered and rare species, including the Hispaniolan parakeet. In December 2012, under the cover of the holidays, Haiti’s Mining Director Ludner Remarais issued gold exploitation permits to the U.S.’ VCS Mining LLC and Canada’s Somine S.A. These permits, which are for five years and renewable for up to 25 years with a possible renewal for another 10 years, were granted without even so much as a pretense of environmental-impact assessment (EIA). Both companies — and probably several others to follow — are expected to use an open-pit (or open-cast) mining process that will involve dynamiting the mountains, poisoning many thousands of cubic meters of water per hour with cyanide, and dumping the polluted waters into Haiti’s Caracol Bay: an area that had been slated to become a World Heritage Site and marine park because of its rare mangrove forest and breathtaking coral reefs. Capitalism was never pretty: not during the slave trade and certainly not now. For Haiti, which has become a free-for-all for rich “investors” from traditional colonial powers like the U.S. and France, emerging colonial powers like Brazil and South Korea, and aspiring colonists from its own diaspora, the process of capitalism is exposed in all its hideousness as it happens in real time. Contrary to the inoffensive-sounding language about aid, development, and reconstruction, Haiti is being demolished in every respect. 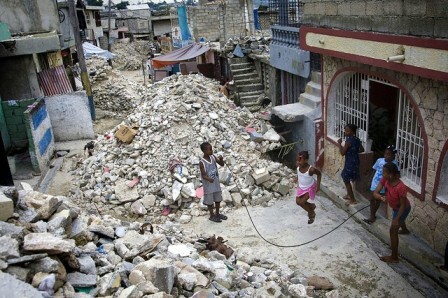 The destruction of Haiti, if it is allowed to continue, will not be Haiti’s loss alone. Gone will be a cheerful and sustainable way of life, the taste for being sated with enough, which we must all learn to recover. The whole model of foreign aid/ngo is broken. Nothing is done, moneys are squandered on foolishness. This is a thorough article… thank you ! One of the worst outcomes of the continued involvement of the so-called friends of Haiti is the obvious inability of the politicians and members of the civil society at large to see clearly in this machiavellian game that is played and replayed against the interest of the Haitian people. Rarely do I read something on Haiti that does not frustrate me. Your article was direct, unencumbered by page filling nonsense, and filled with hard facts. I am grateful to you for this work.